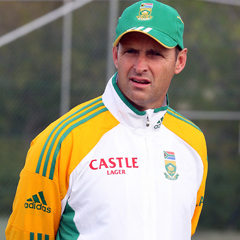 Cape Town - Gary Kirsten has proved to be a coach with a golden touch, firstly with India and now with South Africa. He took India to number one in Test cricket and they won the 2011 Cricket World Cup in his last assignment with the world's most populous cricket nation. In less than two years with South Africa he has seen the country of his birth become entrenched as the best in the world in Tests. Now there is the challenge of forging a dominant one-day team. "We would like to perform at a higher level than we have in one-day cricket," Kirsten said as he looked ahead to a three-match series against New Zealand, starting in Paarl on Saturday. "We've been okay but we haven't been outstanding." Being "okay" is not good enough for Kirsten. "We believe that we are capable of being a unit that can really perform at one-day level," he said. England's defeat by India in the second one-day international in Kochi on Tuesday meant that South Africa gained the number one spot on the International Cricket Council rankings, although South Africa, England, India and Australia are tightly bunched at the top. Kirsten is well aware that simply being top of a fluctuating ranking list is not enough for supporters who are frustrated by the country's repeated failures in ICC tournaments. South Africa want to do well in the Champions Trophy in England in June but the ultimate prize is the World Cup in Australia and New Zealand in 2015. "Winning one of these events is more important in South Africa than in other countries," Kirsten said. "We have a great opportunity this year. We have potentially 23 one-day internationals this year and there will be a lot more emphasis on ODI cricket, which everyone is excited about." Kirsten said the first priority against New Zealand, who they face in Paarl in the first of three one-dayers from Saturday, was to win the series. But he said within that objective there would be a rotation of leading players, particularly the bowlers, and a chance to assess the claims of four new one-day players. "We're still exploring," he said. "With a Test series against Pakistan coming up, we don't necessarily want to use our top bowlers in every game but it is also important that we have a good understanding of who our best players are." Kirsten said rotating key bowlers like Dale Steyn and Morne Morkel was less about physical fitness than mental freshness. "Test cricket is our number one. We will always play our full strength team in every Test we play," he said. "But in other versions of the game something has to give and we are mindful of how we manage the workload, particularly of our bowlers. They are physically fit enough to play in every game but it is more about mental fitness. I want every player to be 100 percent mentally ready when they play for South Africa." One player who will be watched closely in the forthcoming series is wicketkeeper-batsman Quinton de Kock, who turned 20 last month. Kirsten said he wanted De Kock to keep wicket in all three matches against New Zealand to enable AB de Villiers to concentrate on his relatively new role as one-day captain. "It is also an opportunity to look at a really young 'keeper who has some quality batting ability. He reminds me of a young Mark Boucher 18 or 19 years ago who had exciting batting ability and came through as a 'keeper." De Kock faces a disciplinary hearing into an incident in a domestic match last weekend in which he allegedly pushed an opponent. He reportedly has had other disciplinary issues during his short career but Kirsten said he was not concerned. "The longest conversation I have had with him is about one minute," Kirsten said of De Kock. "But I am confident that being exposed to the culture of the South African team will help give him a good understanding of the responsibility attached to it."